In the spirit of today’s post I will not apologize for my long absence from my blog. I will say that I missed it and am glad to be back. I was scrolling through twitter this morning and found this awesome article posted by Women’s Health. If you have a minute, watch the video clip. It’s not long and although it is ultimately a Pantene commercial, it still carries a pretty great message: stop saying sorry for everything! What a perfect topic for quotables. Here are some inspiring quotes about being yourself, owning yourself and being unapologetic about it. Isn’t this the most wonderful message? Be you. No apologies. What a great lesson to pass along to our daughters. Hold on to your power, listen to your inner voice and proceed with confidence. 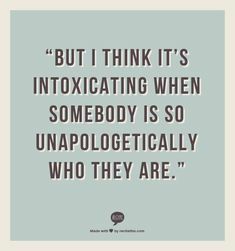 Have a great and unapologetic Wednesday! « Stop! And Do This Right Now.